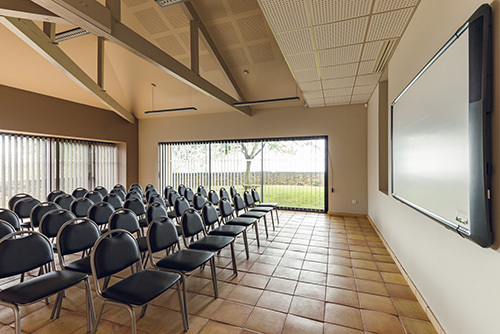 The Domaine d’Ognoas welcomes groups throughout the year (company anniversaries, general meetings, conferences, project launches, seminars, etc.). Modern infrastructures are provided on an exceptional site. 106 m² with 50-m² private patio, WC and air conditioning. Adjustable for configuration as meeting room and/or dining room. WIFI, video projector and tactile wall-mounted screen, 12 rectangular tables and 8 round tables. 60 people seated – 100 people standing – 48 people (meeting/dining). Ideal when providing catering with your events (lunches or meals). Possibility of renting the room with or without the kitchens, per half day (midday or evening) or all day. On request: guided visit of the wine cellars and the distillation room with Floc de Gascogne or Bas-Armagnac tasting. Central site accessible to visitors with reduced mobility. Free parking.